Hamburg and St. Petersburg have been partner cities since 1957, cultivating close economic, cultural, social and scientific contacts. Similarly, the ports of the two cities have maintained excellent economic links for decades. So even in a politically tense situation, Hamburg and St. Petersburg are going for dialogue and cooperation. On August 19, more than 220 representatives of the port and transport industry in Hamburg and Russia therefore gathered for the traditional Port of Hamburg reception in St. Petersburg hosted by Port of Hamburg Marketing (HHM). Bernd Egert, Under-Secretary of State in the Ministry of Economics, Transport and Innovation of the Free and Hanseatic City of Hamburg, travelled across from the city on the Elbe. Igor Lonsky, Chairman of the St. Petersburg’s city administration’s Committee for External Relations, along with numerous high-ranking representatives of the Russian transport and logistics sector, was also among the numerous guests at the ‘Le Vernissage’ panorama restaurant in the Hotel Ambassador. In connection with the port reception, the Port Authority of St. Petersburg invited the Hamburg guests for a port tour, presenting the container port and its terminals from the water in the course of this. HHM CEO Ingo Egloff used his stay in St. Petersburg to visit the Port of Bronka. A new multi-purpose terminal is currently under construction there, due to enter service in September 2015. During the interview in Bronka, Alexey Shukletsov, Managing Director of port operator Fenix Group, presented the firm development plans for the universal port of Bronka and explained its strategic significance for future cargo flows between the Russian Federation and Germany. “Hamburg and St. Petersburg are not only partner cities, but also leading players in the foreign trade relations of both countries. Entering service next year, the Port of Bronka will contribute towards an increase in port capacities in the St. Petersburg region. This will in future lead to not only an improved service for port customers but also, I hope, still more intensive business relations with the Port of Hamburg. The Port of Bronka sees itself not just as a transhipment point for Russia, but also as a hub for transit cargo. 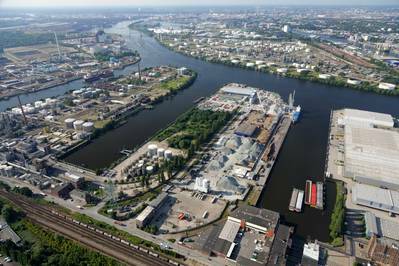 Owing to its proximity to St. Petersburg, the new site could be used to channel transit cargo onwards to neighboring countries and ports.” Alexey Shukletsov sees the new port’s strategic approach to the future as an intensification of cooperation with Hamburg. In the 2014 first half, container traffic between Hamburg and Russian ports reached 330,000 TEU. The main exports handled for Russia were foodstuffs and beverages, chemical products, machinery and equipment. The most important imports were coke oven and oil products, coal, oil and natural gas, as well as chemical products. Since 2003 HHM’s Representative Office in St. Petersburg has ensured good contacts in Russian industry and the transport sector. Representative Natalia Kapkajewa arranges contacts between Hamburg and Russian firms, also making available facts on the respective markets.